Join the largest home alarm system company in Canada. 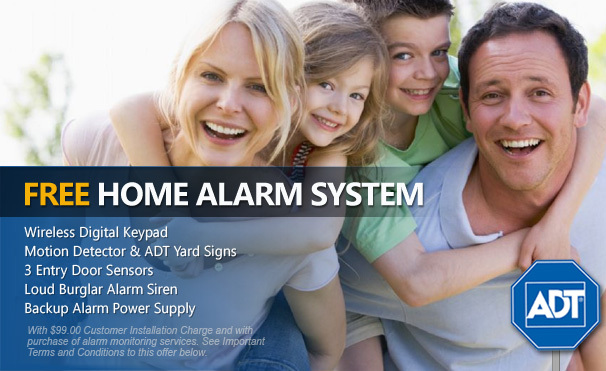 Get a free home alarm system with the activation of ADT’s home alarm monitoring service. 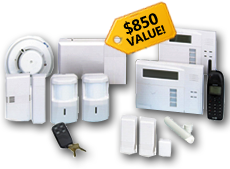 This limited time web only offer means now is the time to schedule an installation of your FREE Home alarm system, valued at $850. Remote access to arm/disarm get text & email alerts. Ask for Details. Easily arm & disarm your home alarm system. Similar in size and shape to a car alarm key chain! Get started by filling out the form! 24/7 ADT Security Monitoring Bundle Package will provide peace of mind and is easy to use for both children and adults. Need your home secured fast? Request next day installation at NO additional charge. When a home security alarm is received, ADT can call the local authorities for help so they can respond to an emergency at your home. Easily arm and disarm your ADT monitored home security system with a touch of a button. ADT monitored protection is affordable, and may save you up to 20% on your homeowner's insurance. Home security professionals monitor your home 7 days a week from 4 interconnected command centers. $99.00 Customer Installation Charge. 36-Month Monitoring Agreement required at $35.99 per month ($1,295.64). Form of payment must be by credit card or electronic charge to your checking or savings account. Offer applies to homeowners only. Local permit fees may be required. Satisfactory credit history required. Certain restrictions may apply. Offer valid for new ADT Authorized Dealer customers only and not on purchases from ADT LLC. Other rate plans available. Cannot be combined with any other offer. Your Privacy Matters To Us. - By submitting this form, you are requesting more information via phone and/or email. We will call via the information provided regardless of status on the do not call or email list. You are under no obligation to make a purchase. Your information is secured and absolutely private.